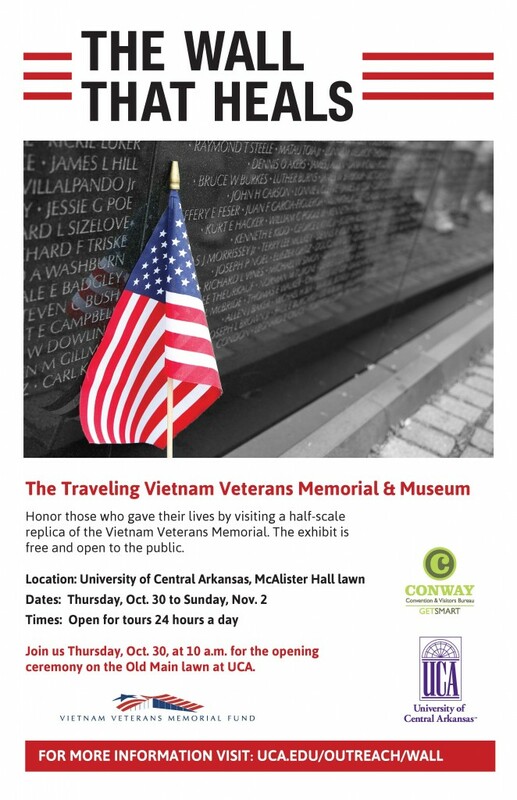 In commemoration of Veterans Day, UCA is proud to be a temporary home to The Wall That Heals, which is a traveling half-scale replica of the Vietnam Veterans Memorial and Museum that allows Americans the opportunity to honor those who served their country during the Vietnam War. This exhibition features a 250-foot replica of the original Vietnam Veterans, which duplicates the D.C. memorial. The Wall allows those who gave their lives to be honored by communities throughout the country. The Wall brings peace, hope, courage and healing to all who view it. Students, faculty, staff, and the general public are encouraged to attend and to bring their friends and family along. 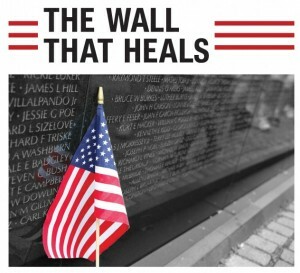 The Wall That Heals will be open to the public 24 hours a day beginning Thursday, October 30, 2014. The wall will remain open until 6:00 p.m. on Sunday, November 2, 2014. Volunteers are still needed to assist visitors touring the wall, so if you are interested in volunteering, please visit uca.edu/outreach/wall. The Vietnam Veterans Memorial honors the more than three million Americans who served with the U.S. Armed Forces in the Vietnam War. It is the most visited memorial in Washington, D.C., with more than four million visitors each year. Its black granite walls bear the names of the more than 58,000 men and women who made the ultimate sacrifice in Vietnam. Since its inception in 1996, more than two million people have visited the traveling exhibit. It has made stops in nearly 250 U.S. locales in addition to an April 1999 tour of the Four Provinces of Ireland and a visit to Canada in 2005. In keeping with Dr. Mashburn’s mission to equip all Arkansas teachers to help struggling learners reach their optimal level of success, the Mashburn Center for Learning has created the Mashburn Center for Learning Resource Center (MCLRC). The resource center also provides professional development for teachers, administrators, instructional facilitators, and other educators. MCLRC serves as a resource for all educational stakeholders to provide accurate and current information about best practices. We will continuously update this resource center with current Arkansas Adolescent Literacy Intervention (AALI) and Mashburn Institute for Social, Emotional, and Service Learning activities and additional resources. When time permits, please view the electronic resource center at www.aalimashburn.com. If a link is password protected, please use “Mashburn” as the password. Mark J. Cooper, Ph.D., L.P.C. During the week of October 20th through 24th, 2014, the office of Student Wellness and Development will present the “I Choose” Campaign for Prescription Drug Abuse Prevention Week. UCA student participants will hold signs with their personal messages written on them to explain why prevention is important and what they choose instead. During the month of October, the office of Student Wellness and Development is partnering with the Student Health Clinic for the annual GYT “Get Yourself Tested” Campaign. Free STD screenings will be available to UCA students, and students who get a free screening at the clinic can enter to win a Fitbit. Fliers have been posted around campus and in Residence halls and apartments. To make an appointment, call (501)450-3136. STDs often show no symptoms, so many people who are infected don’t even know it. The only way to know if you or your partner has an STD is to get tested.